Find the product of common prime factors. Multiply this product with the independent factors. The product of common and independent factors is 120. Hence LCM of 24 and 60 is 120. The product of common and independent factors is 432. Hence least common multiple of 48, 72 and 108 is 432. 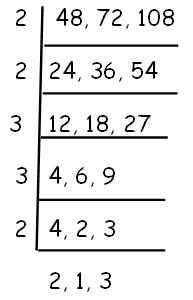 Put the given numbers inside the ladder. 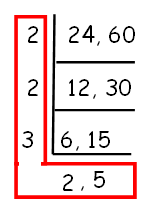 Take the smallest number that divide evenly into the given numbers. Write how many times it will divide into each below the line. Repeat steps 2 and 3 until there are prime numbers left. Least common multiple is the product of all factors. 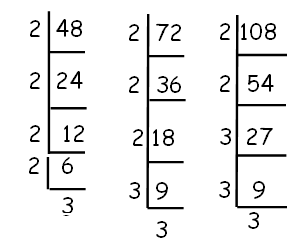 Here 24 and 60 are even numbers bot h are divisible by 2. 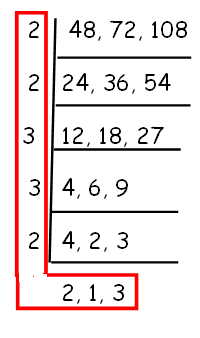 Since 2 and 5 are prime numbers, we cannot continue the process. So we have stopped. Here 48,72 and 108 are even numbers. So all are divisible by 2. Since 2 and 3 are prime numbers, we cannot continue the process. So we have stopped. 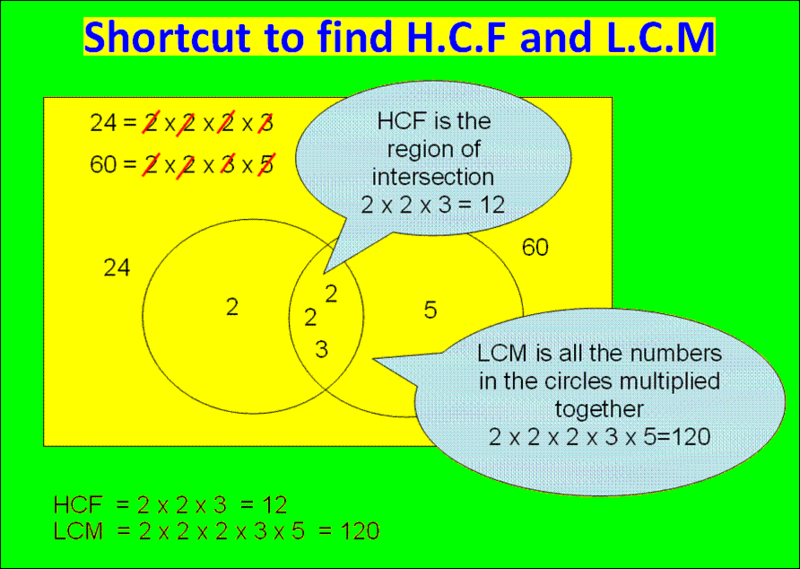 "Venn diagram method for HCF and L.C.M" is the easiest way to find HCF and L.C.M of two numbers. Because, often some people find it difficult to find HCF and L.C.M. At that time they are in need of the easiest way to find HCF and L.C.M. That is nothing but the shortcut to find HCF and L.C.M. Steps involved in "Venn diagram method for HCF and L.C.M"
To know "Venn diagram method for HCF and L.C.M, we have to be knowing the following steps explained. We have to decompose the given numbers in to prime factors. 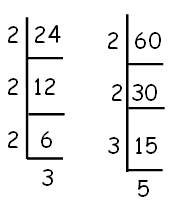 In the example shown above, we have the two numbers 24 and 60. Now, we have to draw two circles as shown above. The first one is for "24" and the second one is for "60"
In the prime factors of 24 and 60, strikeout the common factor (which is found in both 24 and 60) and write that one in common region (intersection part) of two circles. If we find a prime factor which is in "24" but not in "60", strikeout that one and it has to be written in the circle of "24" (not in the common region). If we find a prime factor which is in "60" but not in "24", strike out that one and it has to be written in the circle of "60" (not in the common region). This process has to be continued until all the prime factors of both "24" and "60 are struck out. Once all the prime factors of both "24" and "60" are struck out, we have to do the following works to get HCF and L.C.M. H.C.F = Multiply the prime factors which are found in the common region (Intersection part). After having gone through the stuff given above, we hope that the students would have understood "Least common multiple". Apart from the stuff, "Least common multiple", if you need any other stuff in math, please use our google custom search here.